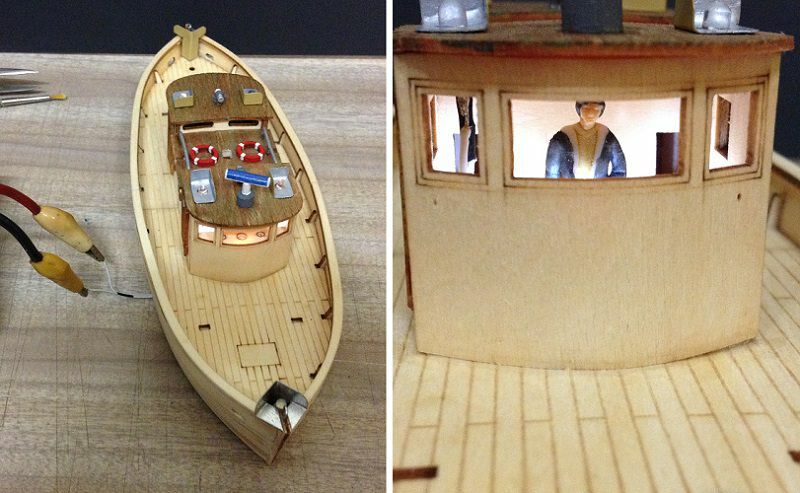 As some may know I am building a Bridge and Boat Diorama. This project, at this time, is 2/3 complete. 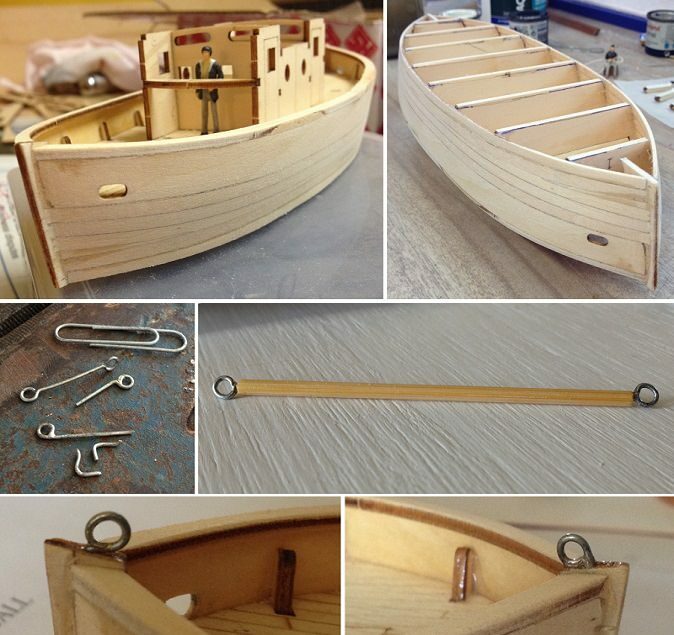 Today I am partly through building the small boat for that project. I hope nobody will mind if I start a thread on this boat's build log here. 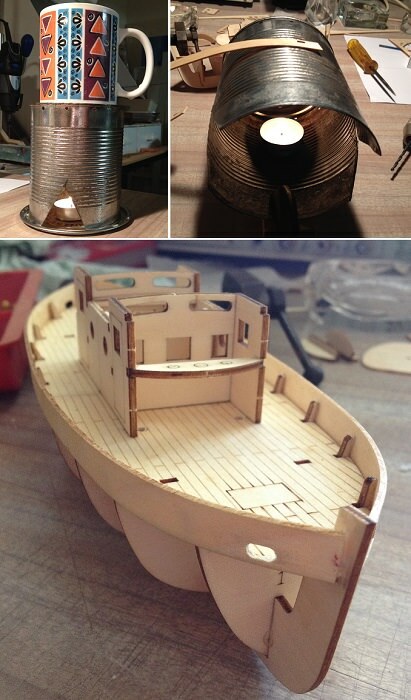 This is my first boat model. 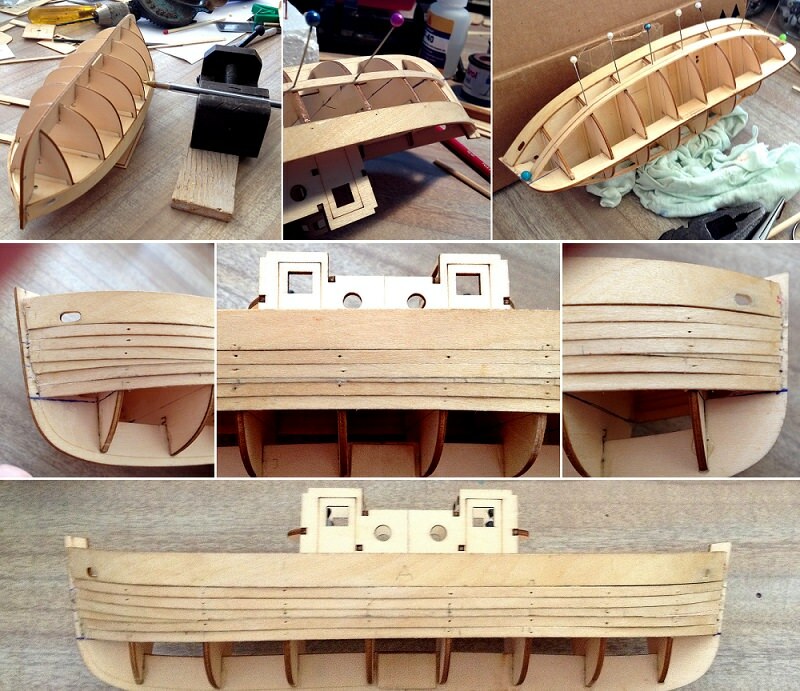 It is being built from two laser cut wood kits. The boat has to be symmetrical because it will travel up and down stream in one line. Not turning around. So it has to still appear to be going forward when it reverses back to its starting position. To make this appearance I have decided to collide (bingle) two bow sections together. 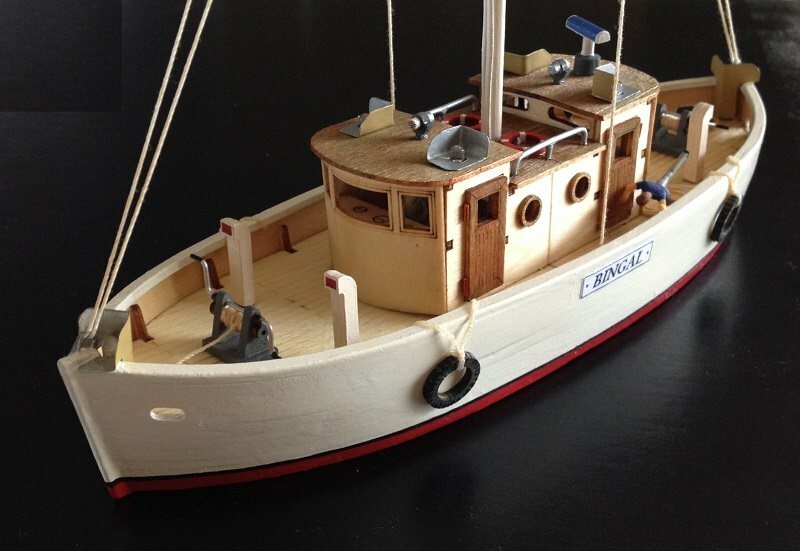 In regards to the boats name "Bingal", it was a coincidence that this boat's diorama is about Wardell's lift-span bridge, and Wardell's original Aboriginal name was Bingal. Anyway, I got the kits from China via eBay (only $13.50 each). It presented as a good opportunity so I went for it. 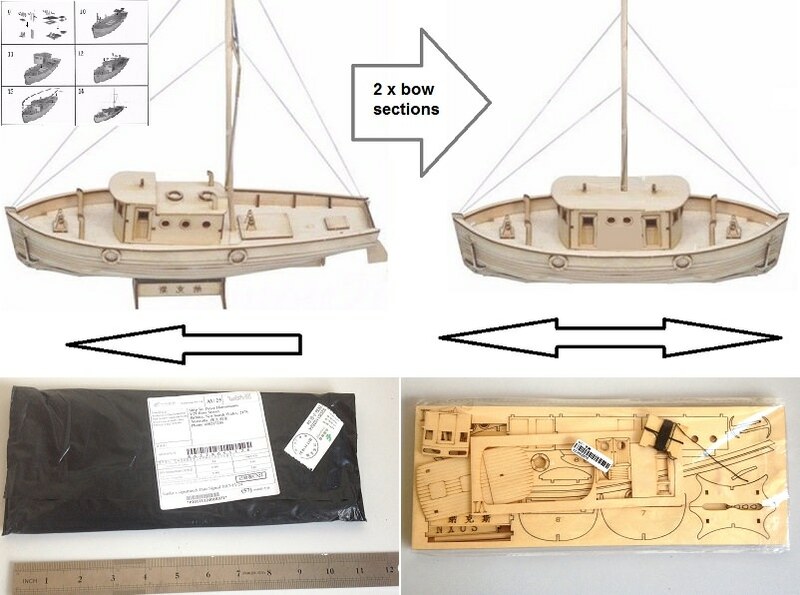 Below is how the kit arrived by post, and how the advertised image got altered to see how the symmetry will look. The deck width, at its widest point, became my half-way mark of symmetry. Corresponded that point with the keel. Then I cut those parts and glued them together with kit off-cut strips for added support. I use heavy bits of glass (flat areas) to apply pressure to glued areas. Also baking paper underneath. Glues, that I know of, does not stick to the glass or waxed paper. 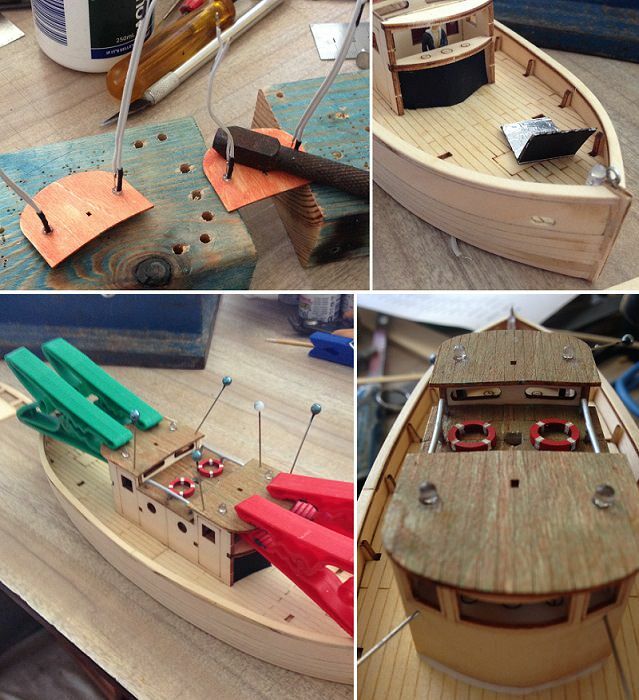 The bottom photo is not glued, it's just to see what the boat shape will look like. I discovered that the top plank, and others were too stiff to bend along the bulkheads. That is, there was too much tension, perhaps too much to keep the plank in place with just using PVA glue. So I searched for ways to bend the planks. 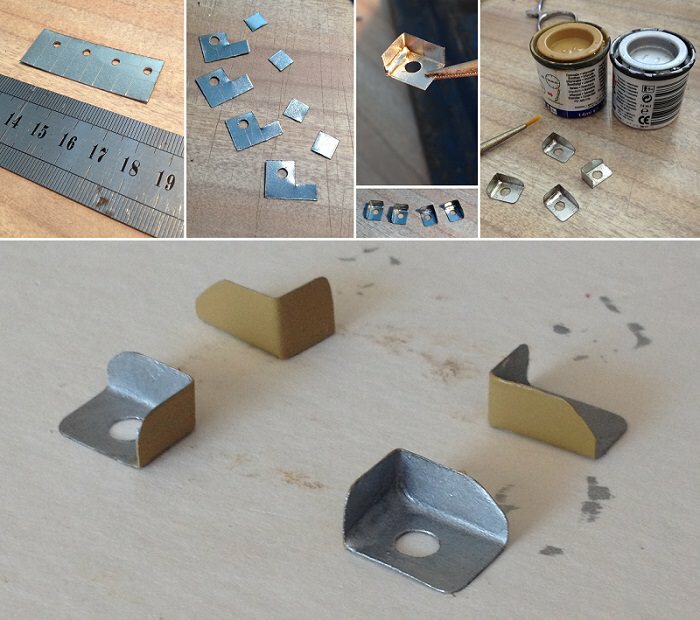 I came across a DIY hot iron planking jig. It involved heating a tin can with a tea-candle. The funny thing is that I had this set-up for keeping my coffee hot in winter time. By clamping the can to the table I was able to hold down one end of the plank with a screwdriver edge and pull down the plank along the tin can surface. It only took a few seconds to do, and I found it easy to shape it roughly to the hull. Enough curvature to create minimum tension to the glued sections. Then I marked the bulkheads where I wanted the waterline. I read there were two ways to add planking, the best way involved dividing each bulkhead into the number of planks to be used and then shape each plank to suit. That is fine if I were to show the planking, but this boat will be painted. So I opted for the other method, to simply add planking from top and bottom and somewhere near the middle, shape the final planks to suit the gaps. Actually I did a bit of both just for the experience. I sandpapered the ends of the planks to the shape of where it is to join, just to make it a bit of a cleaner fit. Thank you Zoltan, Uwe, and Andy for your kind interest and 'likes'. Will be posting some more photos later today. I am a bit busy at the moment (answering phone calls). Also, in the middle of painting the boat. The boat has its own lighting. Quite a few of them actually. I used 3 mm clear LEDs. In this way, when the upstream red and green LEDs turn off, to be exchanged for the downstream pair, they will appear neutral. 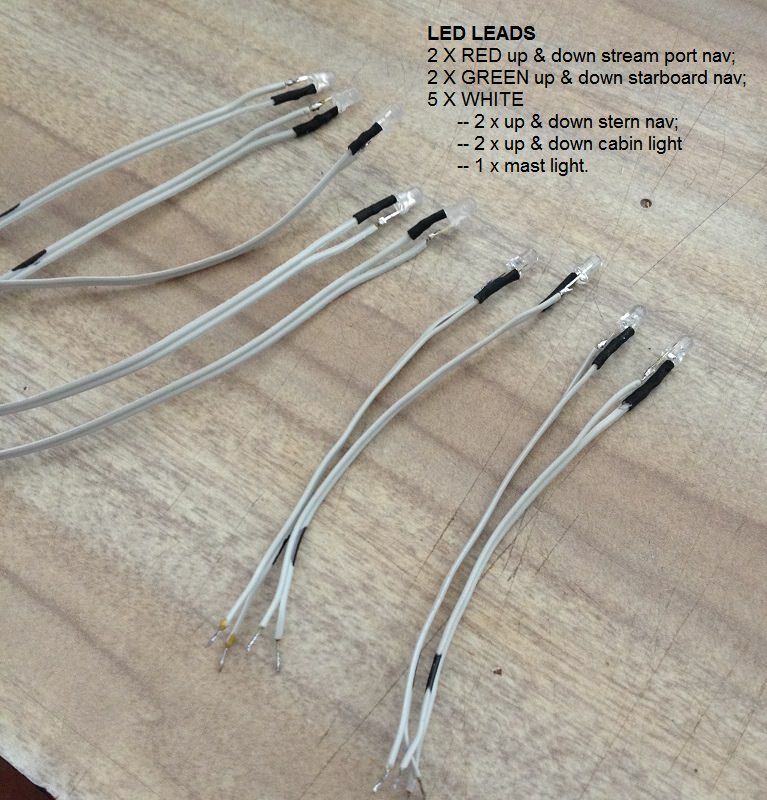 I only insulated one LED connection, per LED, to stop any possible short circuits. The black mark on the other end of the leads is to let me know which lead of the LED is the cathode (negative lead). 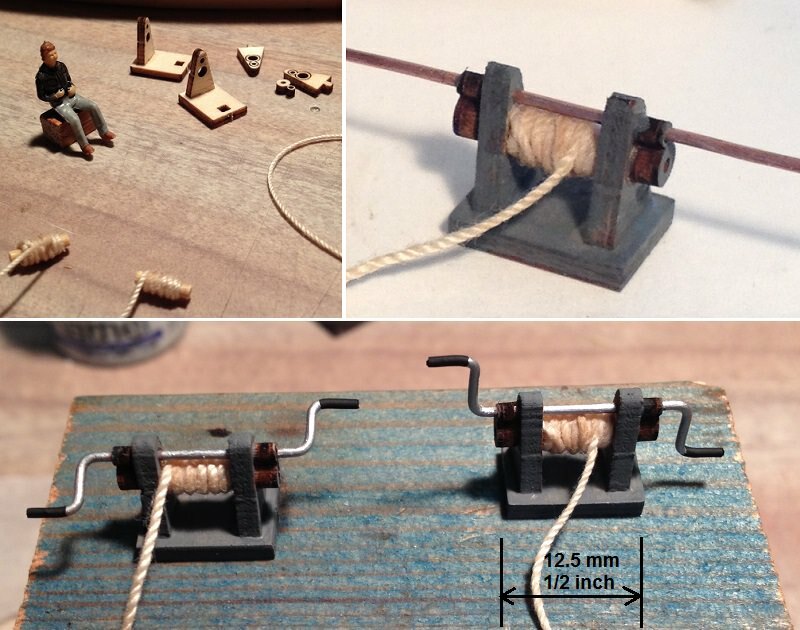 The kit winches had no axles or drum, so I made my own from bamboo skewer. Added rigging string for anchor chain. Added copper wire, bent into a crank shape and painted it. 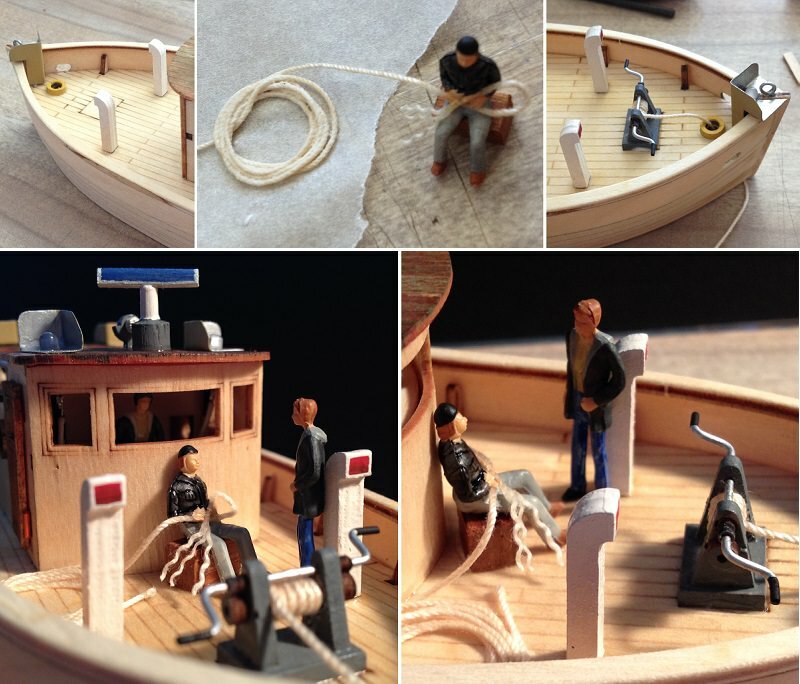 Got one of the figurines and glued him (a deckhand) to a small block of wood for a seat. Painted other bits. Used coloured ink to darken the doors and cabin roof. 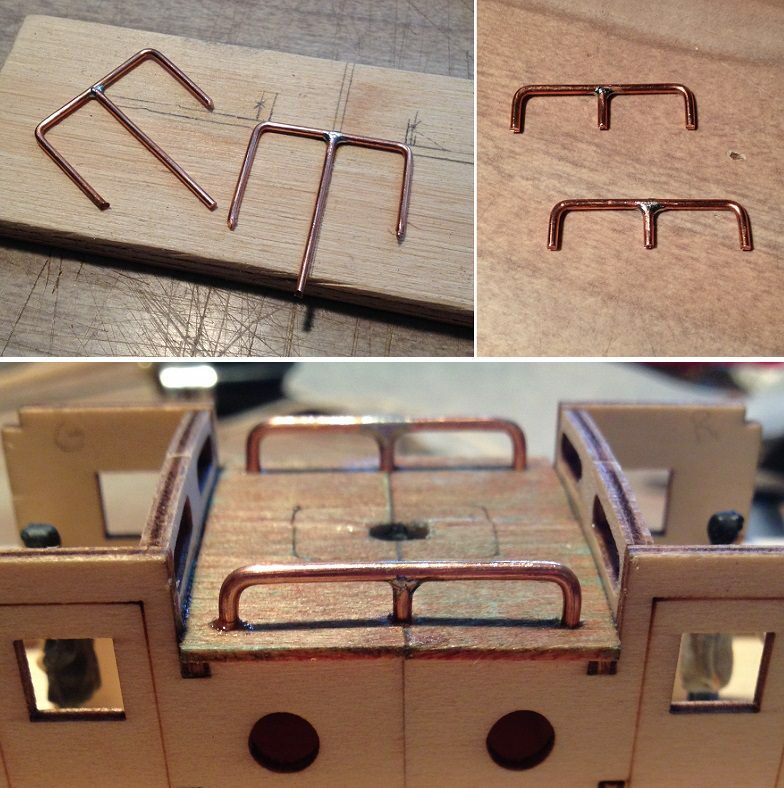 Snipped off some copper wire and used them to look like door hinges. Painted four larger rings to look like tyres. Then I unraveled some string to make it look like the deckhand is splicing a rope. 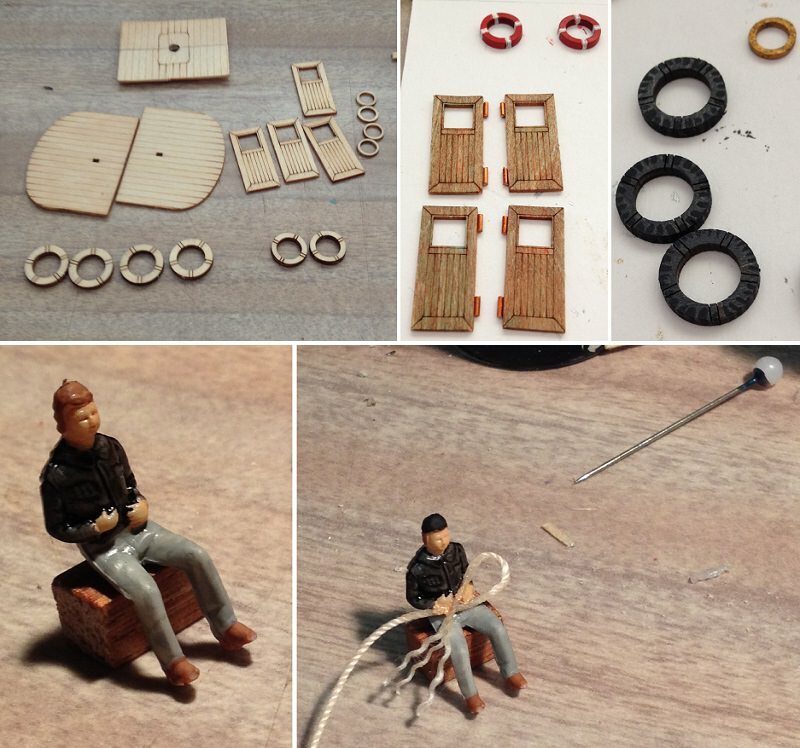 Though all these things are not part of the kit, I had lots of fun making the extras. Added the gunwale. Used some wood filler and gave the hull a final sanding. Used a paperclip for making some eyelets for rigging. 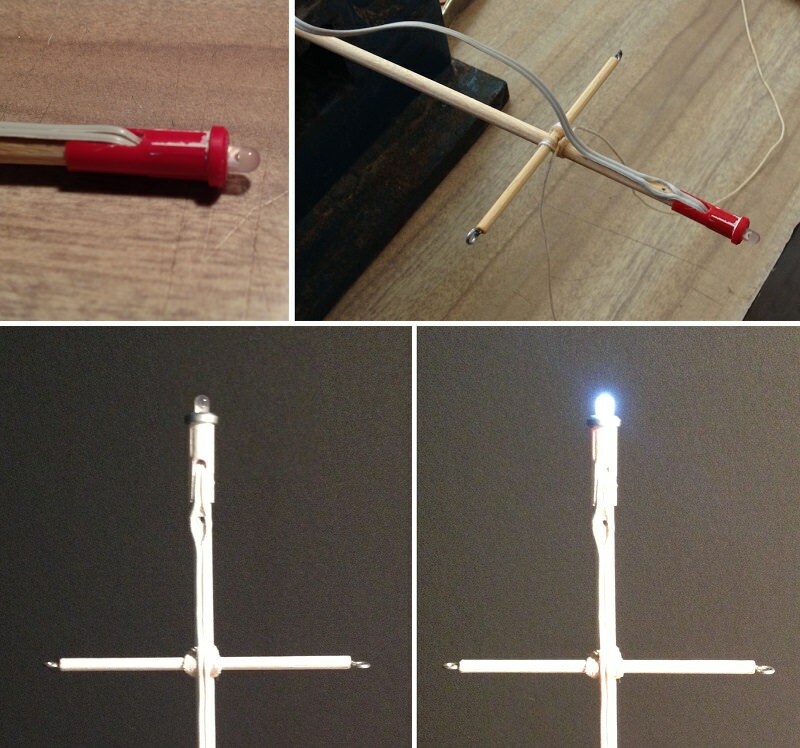 Used the end of a Biro to house the mast light LED. 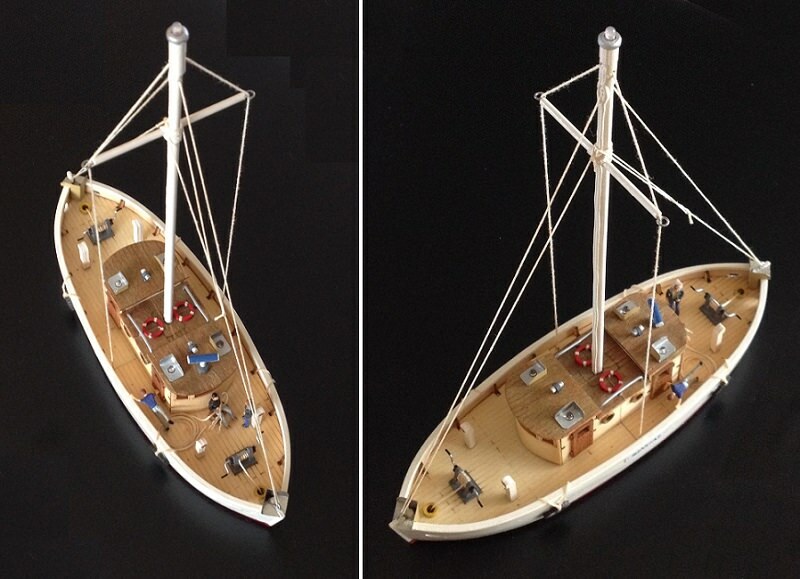 glued wire along the mast, and applied a few coats of white gloss enamel paint. Prepare the central roof for taking the mast and its wiring. Glued the roof on. Bent some thick copper wire to make hand rails. Drilled their holes in roof and glued them in place... an another innovation. That will do me for today. To be continued. Thanks John, I was going to say it looks like a Pushmi Pullmi from the Doctor Dolittle children's books but I wasn't sure if anyone would know what I meant. Added central roof section with holes for the mast (and wiring). Bent and soldered some thick copper wire to follow a template. Drilled small holes to accommodate the glued in handrails. Added the red and green navigational lights to cabin roofs. The Front wall of wheelhouse was too thin to block out the cabin light, which I had under the console. So I used card, one side blackened and the other with aluminium foil (an after thought) to reflect the light more evenly within the cabin. Added life preservers and painted the railing with silver paint. Used a coffee can lid to cut small tinplate navigational light hoods. Bent and soldered. Painted with silver, but I realized later it would have been better to just give the inside section a coat of clear gloss. Made another set for two stern lights. Added the hoods to the LEDs. The kit had signal lights, so I painted them and added onto the cabin roofs. Then I decided to make and add a radar antenna to bring the old boat up to date. Added painted figurines, and other bits. I have done other bits in between the above photo and the one below, but these two are of relevance. 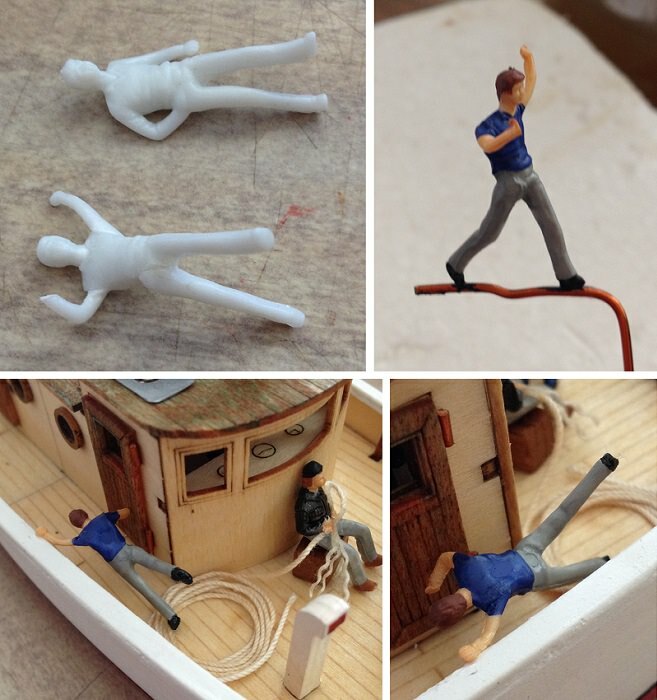 Below, a figurine gets chopped up and reassembled to become a Bingal deckhand having a bingle. I know its not up to par with you guys, but I am happy with my first boat build, and I had LOTS of fun doing it. 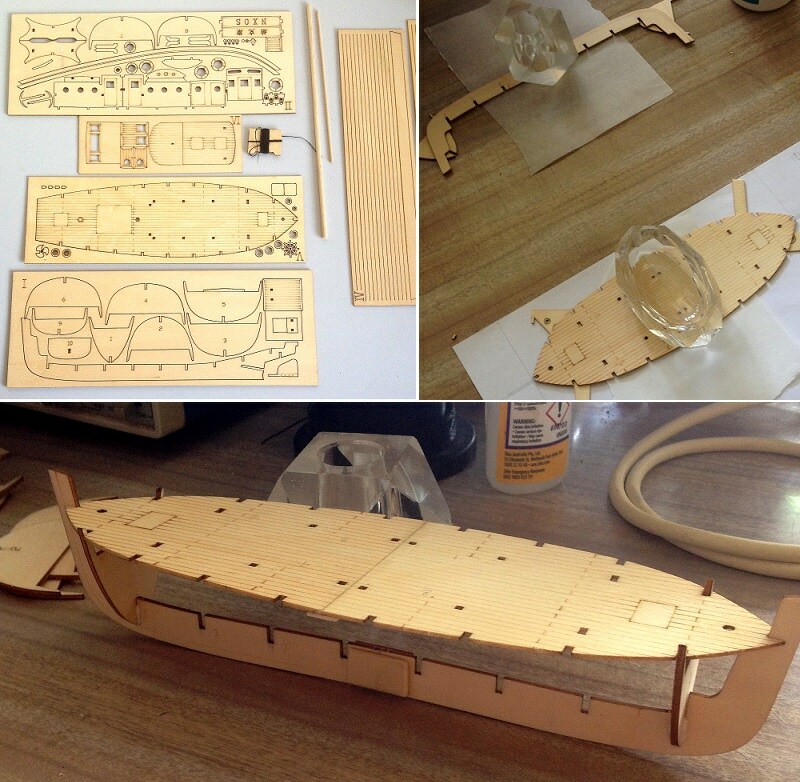 I think I got the model boat building bug. 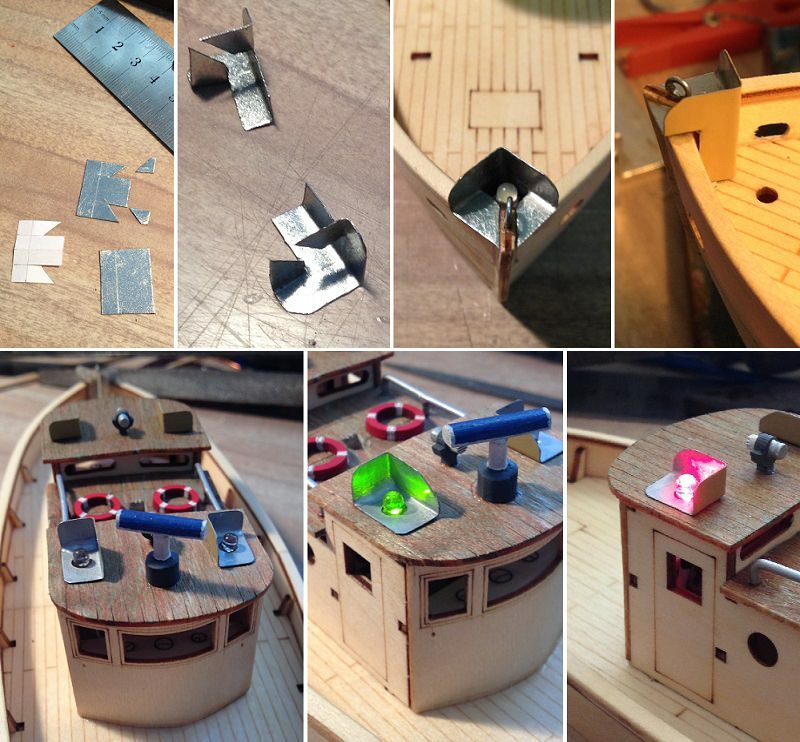 In the future, do not expect me to ever build a boat without something quirky going on. Nice details, hope the guy on deck didnt break a leg. ... hope the guy on deck didnt break a leg. Ha ha ha. If he doesn't, somebody is going the get hanged for it (after he splices the rope).